The Broncos are potentially making a statement about their future with their second-round pick. 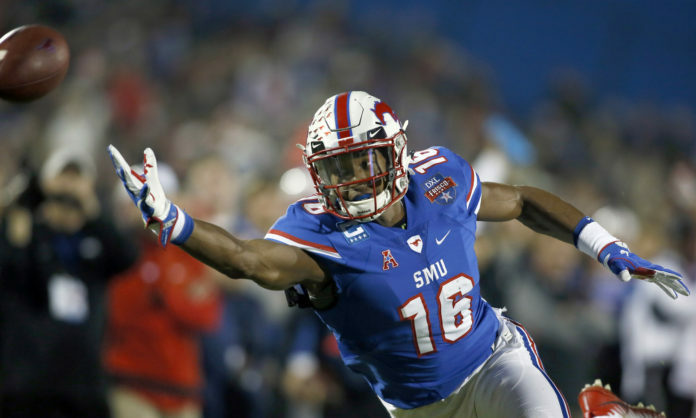 To open up their second day at the 2018 Draft, Denver picked up SMU wide receiver Courtland Sutton with pick No. 40. Sutton hails from Southern Methodist University, where he earned two first team all-ACC selections. In his final season at SMU, he had 68 receptions for 1,085 yards and 12 touchdowns. Over his entire career, he scored 31 touchdowns, the second most in school history. He is a big, tall receiver that isn’t afraid to be physical when contesting balls against defenders. He can use his quickness to pull away from cornerbacks and his height is intimidating to play against. Sutton will most likely come into training camp as the No. 3 receiver, a position the Broncos very much needed. However, the pick also speaks volumes as to where the Broncos are planning to go within the next few years. With both Demaryius Thomas’ and Emmanuel Sanders’ poor years contributing to a 27th-ranked scoring offense and 20th-ranked passing offense in 2017, the Broncos have been on course to fully rebuild while their defense is still relatively strong. Sutton becomes the first step in that process, and now becomes an obvious threat to the future of either Sanders or Thomas. Thomas should be the most worried between the two veterans, as Sutton is almost a mirror match of the wideout. Both stand at 6-foot-3 and weigh in their 220’s. Sutton also fills the role of a potential No. 1 receiver as he gains more experience. He is willing to catch in traffic and has great positioning and agility to extend his range for underthrown and overthrown balls, as well as jump balls. Meanwhile, Thomas is 30 years old and has shown a significant decrease in production in 2017 after failing to reach 1,000 yards in a season for the first time since 2011. He also dropped his output by 300 yards in 2016, showing his down year may not have been just a fluke. Thomas’ contract is also reaching a point where the team could move on. If Thomas were to be cut before the 2019 season, the Broncos would only have to worry about $2.2 million in dead money, saving themselves about $15 million. Sanders should also be on high alert with the pick. Sutton can fill a physical role that fans have wanted out of Sanders for the past two seasons, as he is willing to run crossing routes and run through traffic in the middle of the field with no fear. He plays big and is willing to help block in the in the run game as well. Sanders also had one of his worst years as a Bronco, only collecting 555 yards on 92 receptions and two touchdowns, almost less than half of his output of the year before. Sanders also has an out in his contract for the Broncos, who could cut Sanders prior to the 2019 season for almost $2.7 million, a savings of about $10 million. Sutton’s role this year is obviously going to be as a No. 3. But, look for him to steal catches and plays from Thomas and Sanders as he gains experience. He may wind up becoming the Broncos’ No. 1 or 2 in the near future as he becomes used to playing in the NFL.